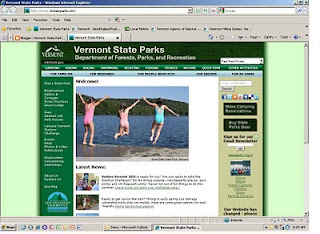 Tyler Machado, a senior at St. Michael's College in Colchester, spent his last semester interning with Vermont State Parks redesigning the website into a more user friendly and attractive version (as seen below). As a student majoring in journalism and mass communications with an art minor, Tyler enjoys being able to combine his skills in arranging information with his creative side to create visually attractive, educational web pages. Despite his passion for web design, Tyler values time away from the computer, hiking, skiing, and generally enjoying the great outdoors Vermont has to offer. When the opportunity for joining his web development skills with his love of the outdoors came along, Tyler jumped at the chance saying, "I'm really glad I could help out an organization which I know and strongly support".